We invite you to take this one-day excursion by the Circum-Baikal Railway, unique monument of engineering art of the end of 19th century. Constructed on the south-western shore of the lake between Port Baikal and Kultuk settlement, a 84-km-long railway (52 mi) includes 424 engineering structures including 39 tunnels with a total length of 8994 m (5.6 mi). Tunnels and stone galleries of the Circum-Baikal Railway are unique because they were constructed upon non-typical projects and were not reconstructed later, so they keep the initial idea of architectures and engineers of the early 20th century. With respect to volume, complexity and cost of works the Circum-Baikal Railway ranked second to none among railways of Russia. Before the Revolution of 1917 it was called "Golden buckle on the steel belt of Russia": buckle because it connected the Trans-Siberian Railway pulled apart by Lake Baikal, and golden because regarding the cost of works it excelled all railways existing in Russia. 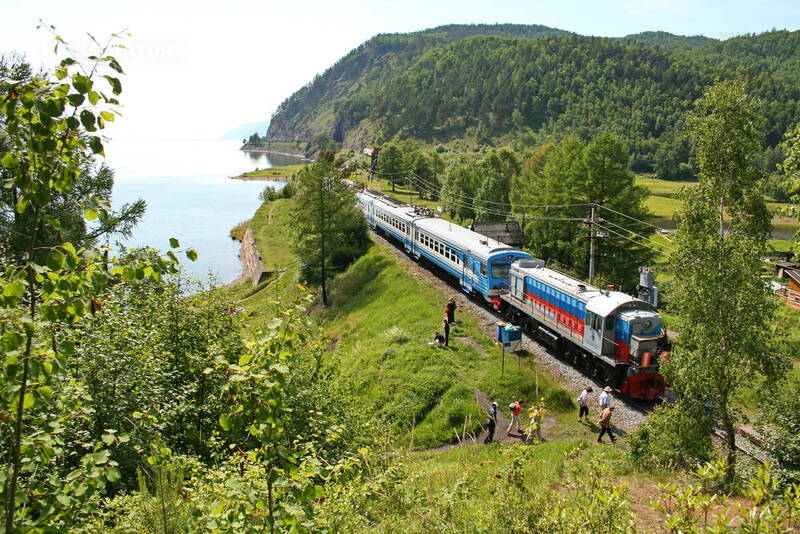 This name was also given to the Circum-Baikal Railway thanks to its unique, second to none in the whole world look that combines complex architectural constructions with extremely picturesque shore landscape of the lake. Nice music sounds in train during the journey, friendly and attentive staff is of service to travellers, and guide tells a fascinating story of the Circum-Baikal Railway construction. On the way several stops are provided in the most interesting and beautiful places with leaving the train accompanied by guide. Arrival to the railway station of Irkutsk. The boarding starts 15 minutes before the train leaves. The number of the railway line is indicated on the display.above the way out to the platform. The train goes without stops to Slyudyanka. The stop lasts 30 minutes and you have possibility to go for a walk. The interesting fact of Sludianka is that it's railway station building is the only one that built of the pink and white marble. Here the excursion programme begins — with sightseeing stops and leaving the train accompanied by guide. During the excursion we will visit: the Angasolka village, Polovonnaya station, the unique architectural complex "Italian wall" and the station Ulanovo (Khvoynaya). Visit to the old building of the railway station. Taking a ferry to Lystvianka. Boarding bus and departure to Irkoutsk.